WIRED's mission is to report on technology and tell stories of how it impacts every aspect of our lives. The company needed to move to a subscription business model to create a sustainable source of revenue, realign their journalists to the mission, and meet content expectations from their audience. 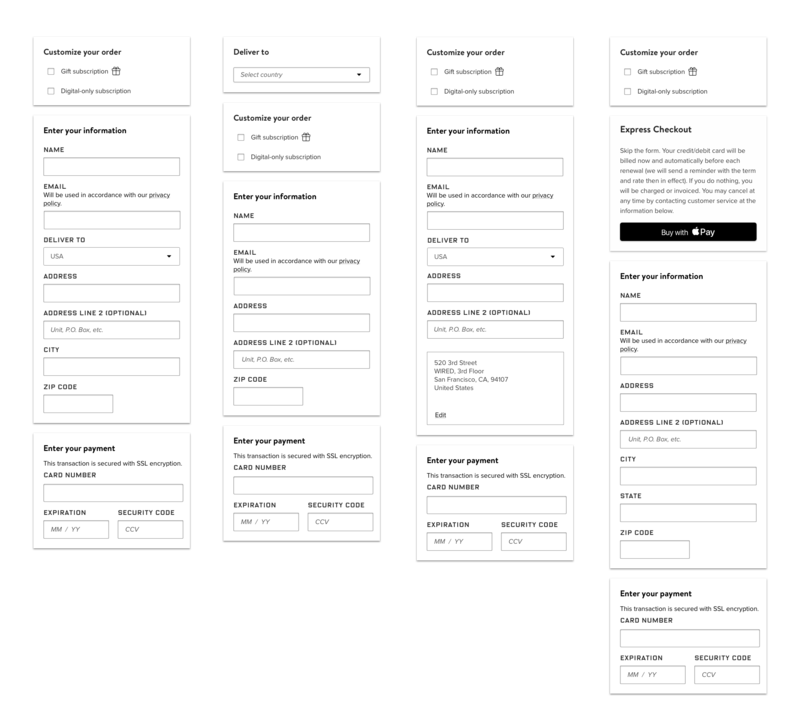 The subscription signup was one part of the paywall I worked on as the sole product designer in the three month timeframe. I collaborated with 3 product managers, 2 creatives, 2 dev teams, and the consumer marketing between WIRED and Condé Nast. The team launched the MVP of the paywall by the deadline and ahead of another Condé Nast brand that started their paywall work before WIRED. As of August 2018, there are 30% more signups than 2017. How are other international subscription-based products funnel users to signup? What design patterns have other publishers and non-publishers used? What were the challenges the stakeholders faced and what did they care about the most? What are do we know about the WIRED audience? The vision was to optimize for a flow that gave users access to the stories faster and in return increase conversion rate. My process was to design with the intention of making tradeoffs down the road since specs weren't fully defined. In parallel, I facilitated conversations to collectively define the specs. By understanding the basic tasks for the signup and the subscription types and offerings, I determined the minimum requirements by understanding the basic tasks for the sign up. 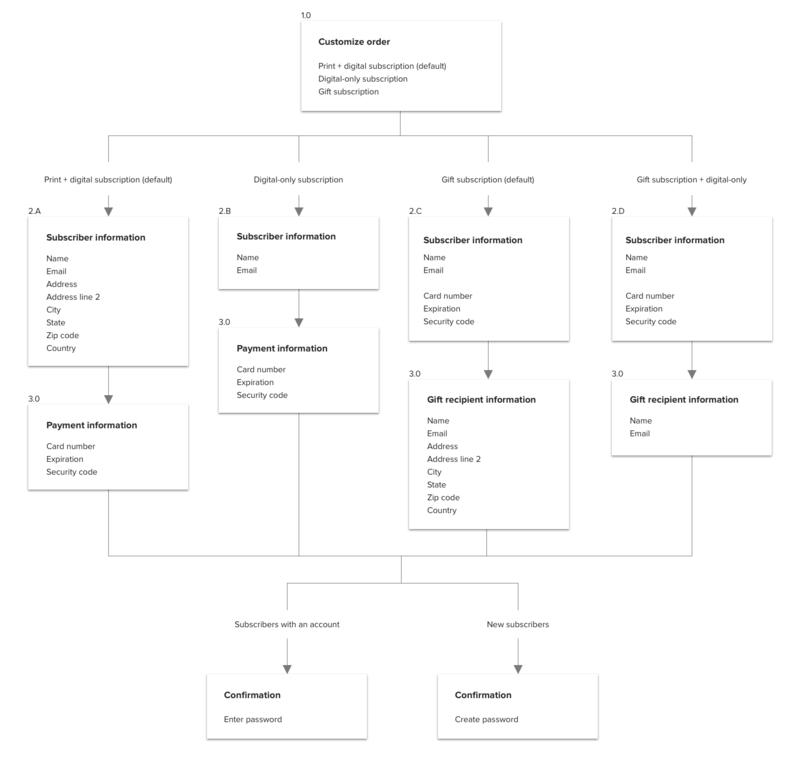 From here, I thought about logical groupings before considering how the user paths would change based on the subscription type and offering. I then explored a few directions to figure out how progressive disclosure can filter users into different paths based on their previous input. 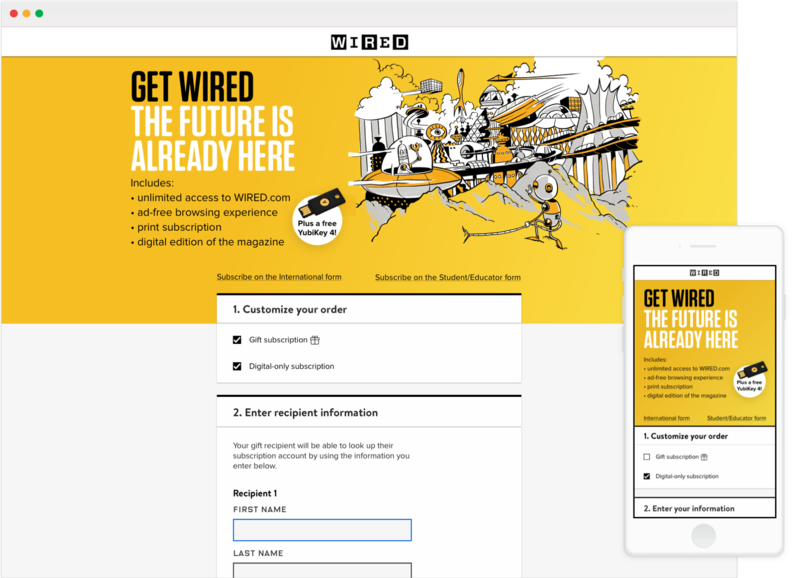 This ensures that the signup is as short as it can be and we assume that it gives users a sense of accomplishment. We made a number of tradeoffs when we found out that we had less resources and more third-party vendor constraints than originally scoped. 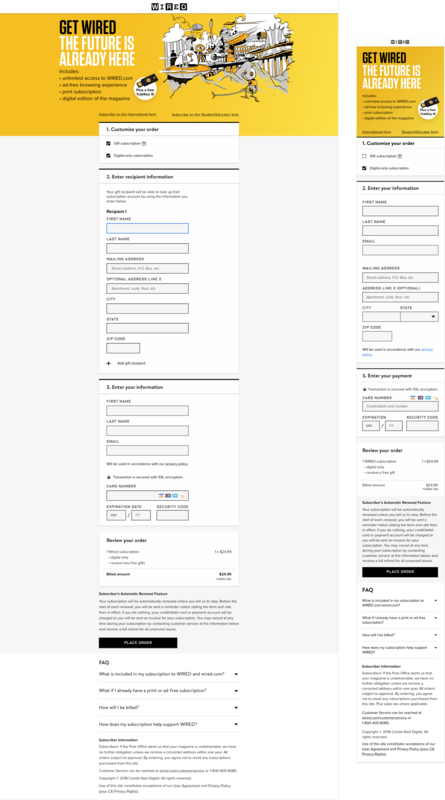 This affected the design by increasing the number of input fields, separating the forms into three, and cutting out autosuggest/express payments. 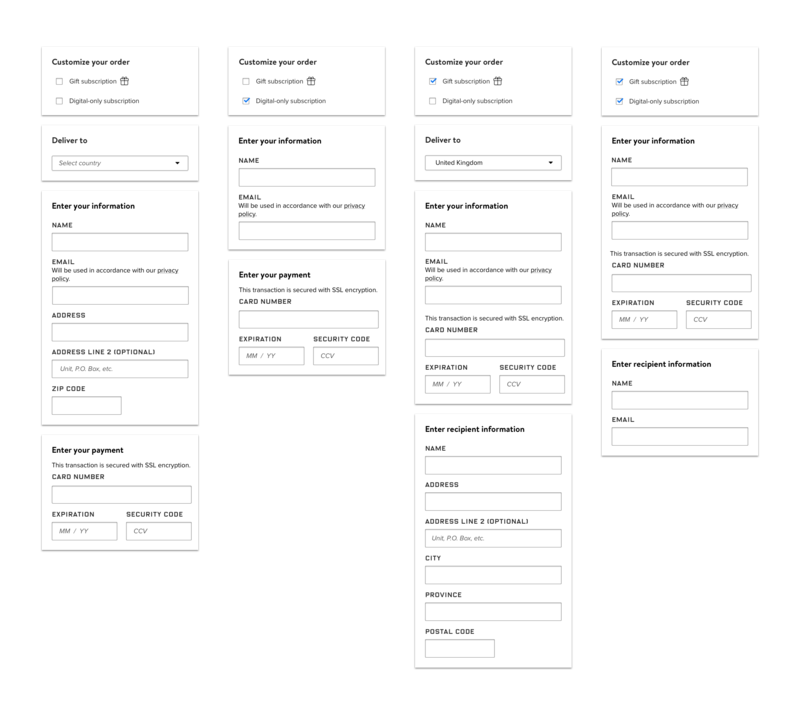 To ensure we stayed true to the design vision, I worked closely with the developers to QA that the input controls and the error prevention were implemented. Our time constraint only allowed the team to internally test the form before shipping on February 1, 2018. It was an interesting challenge to work on a product where the output is defined long the way. This taught me to constantly evaluate what the design decisions balanced the business needs and especially the reader experience since paywalls impact the reading experience. Even though what we launched was the MVP, I was still proud of what we accomplished with the intense deadline. I’m excited to see where this takes WIRED.